What I Found When I Was Wrapping Gifts – my books. my life. As I checked the mail for the last time before leaving for vacation, I was a little disappointed. I still had not received my Book Blogger Holiday Swap Gift. It looked like I was just going to have to wait until after Christmas. The day after I arrived in Michigan, I went over to my in-laws to pick up the packages that I had shipped there from Amazon. I took them back to my mom’s and happily sat down to wrap all the gifts. As I opened one, it was already wrapped. I didn’t remember asking for gift wrap on any of them so it was a little strange. I had Ben inspect it to see what it was. Turns out it was my Holiday Swap gift! I figured it would be sent to my home in Florida because that’s the address I provided on my form, but my Secret Santa outsmarted me by purchasing it off my amazon wishlist and sending it to the address listed there (BTW, I am very glad that it was not sent to any of the bad addresses on my amazon account – I’m not sure what would have happened if it ended up at my parent’s old house or a random apartment in San Francisco or Tarpon Springs). What a pleasant surprise. 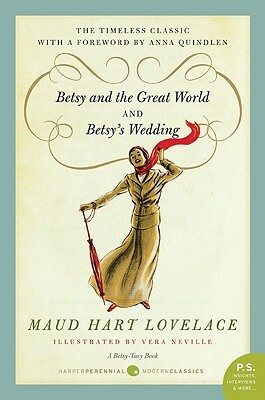 I am very excited to get to this last installment of the Betsy-Tacy books. I am also thankful for the two new blogs to read as a result of the Holiday Swap. This is wonderful! It must have been an amazing surprise, when you unwrapped the package! Hope your holidays have started well! Oh how fun! I hope you enjoy it. I am working my way up to that one. Betsy is still in high school where I’m at.